The People We Love To Hate: P.Diddy adds a Big Mac to his resume. P.Diddy adds a Big Mac to his resume. 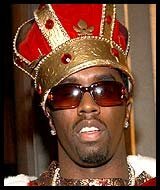 P.Diddy is going to design McDonald's new uniforms. Watch out Burger King. Ba da bop ba da.....I'm lovin it!